This Grapefruit Rosé Sangria has everything you want in a summer cocktail – it’s refreshing, delicious, not-too-sweet and packs a sucker punch to the taste buds! Great for bbqs and deck parties! Friends, I’m not gonna lie. Coming back to work this week after a week off was capital ‘R’ rough. Like, give me ALLLLLL the coffee. Let me sleep for 24…no, 36 hours. Don’t you dare look at me. Wait. What? It’s only Thursday. I need a face mask. No, I’m not being dramatic. Ok, maybe a tad. True story—>hubby told me that after the alarm went off yesterday morning I started to moan in a high-pitched voice ‘nooooooooo…….nooooooooooo……NOOOOOOOOOOO’ (P.S. I don’t remember that – at all). So, yeah, that’s me this week. Feel me? What do I need a week after relaxing? Sleep. Ha! Sangria originates from Spain and is traditionally made with red wine, lots of fruit and typically brandy. 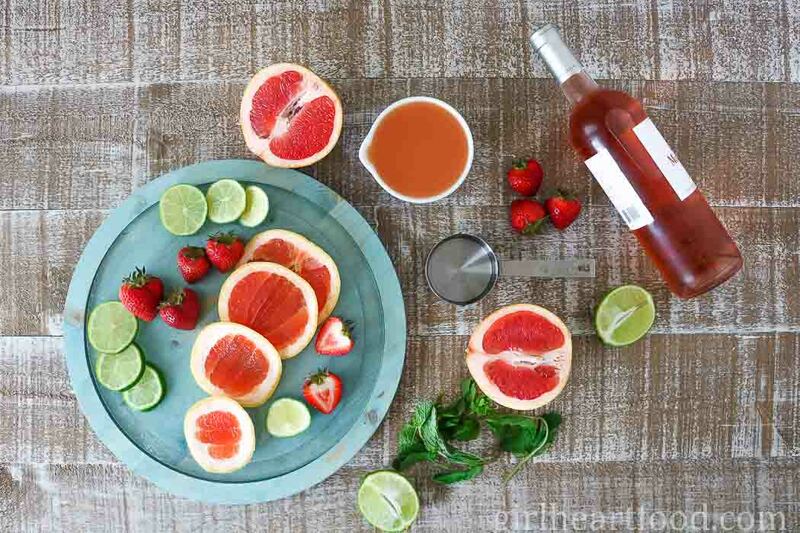 But, like anything, over the years there have been all sorts of variations using white wine and rosé , like here with this grapefruit sangria recipe! This rosé sangria recipe is not sweet. I don’t typically go for overly sweet things, but if you do, you do you! Speaking of sweetness, the sweetness of the wine you use in this sangria recipe will greatly affect the overall sweetness of the drink. I used a dry rosé , but you can totally use something sweeter. If you like things extra sweet, add a little sugar or simple syrup (equal parts sugar to water dissolved and cooled) to taste. Haven’t got that kind of time? No worries! Just dissolve some sugar in the wine. When serving this grapefruit sangria, I filled the glasses 3/4 of the way up and then topped up with club soda. But, that’s not completely necessary. You can enjoy this rosé sangria as is. I added some ice cubes to the sangria when serving, but that’s optional. If you like, you can also freeze some grapefruit juice and have little grapefruit cubes so your sangria won’t get diluted. I used grapefruit vodka here to really enhance the grapefruit flavour goin’ on. Can’t find grapefruit vodka? Orange flavoured works well here too. This sangria recipe is best the next day after all the flavours have had a chance to hang out and get to know each other. However, if you can’t wait that long, that’s a-ok too! What do to with Leftover Fruit from Sangria? Recycle the fruit for another batch of sangria the next day. Your fruit will be extra wine-ey! So cheers to thirty Thursday and to it being thisclose to Friday with this refreshing grapefruit rosé sangria! If you need me, I’ll be sleeping all weekend, lol. Until next time take care and chit chat again soon! This Grapefruit Rosé Sangria has everything you want in a summer cocktail - it's refreshing, delicious, not too sweet and packs a sucker punch to the taste buds! Great for bbqs and deck parties! Place grapefruit and lime in the bottom of a large pitcher (add sugar to taste, if desired). Muddle with a wooden spoon a little. Pour wine, grapefruit juice and vodka over top. Add sliced strawberries and stir. Place in fridge for 3 hours or overnight (or enjoy right away if you want). Pour mixture into glasses, filling about 3/4 of the way up. 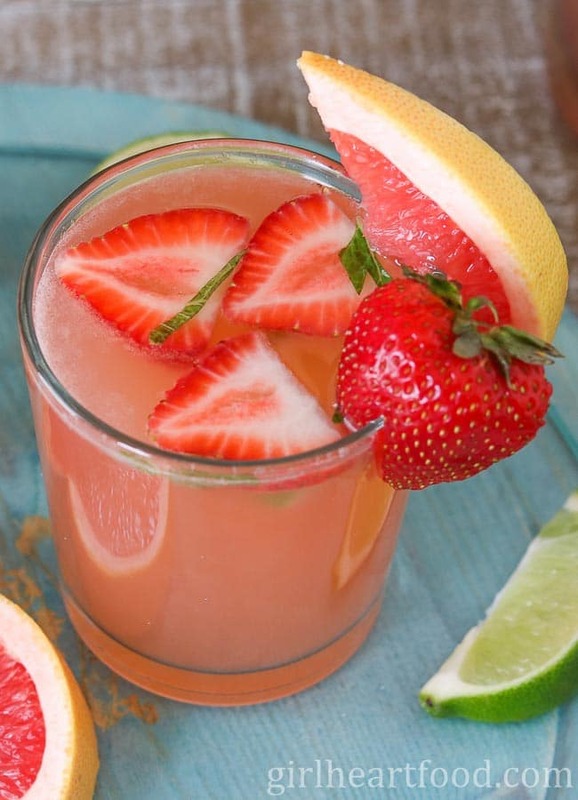 Top with club soda and garnish with mint, a strawberry and a grapefruit slice. Enjoy! The sweetness of the wine you use here will greatly impact how sweet your sangria is. I used a dryer wine because I don't like things too sweet. If you like things sweeter, choose something that you like. Also, if you want things even sweeter, add a little sugar to the sangria to taste. If you can't find grapefruit vodka, orange vodka works lovely here too. This is my kind of sangria – it sounds amazing. Pinning this to make this weekend. Thanks so much, Kristen!! Enjoy! “I need a face mask.” bahahaa amazing and that is exactly how I feel coming back to work after vacation. This Sangria looks like it might take the edge off. Thanks for sharing Dawn! It’s been SO hot here in AZ and this drink looks so cool and refreshing. Is it bad that I think sangria with lots of fruit is kind of healthy cocktail?! Hahaha….I like the way you think 😉 Thanks Anne! It’s about 38 degrees here right now and this looks sooooooo refreshing. I definitely need it in my life. Also – LOVE your photos! Gorgeous. You totally do 😉 Thanks very much for the sweet comment, Jo!! looks very refreshing! I’m not a big fan of ‘too sweet’ anything and this sangria looks just about right to me. Great photos too! Thanks Bernice! It totally is 🙂 Appreciate it, my friend! I love to sip a cold sangria on a hot sunny afternoon…But not a too sweet one. Yours seems to be the kind of sangria I like! It will be my “project” for the week-end! And by the way, your pictures are wonderful! The colors and the light are perfect! Yay! So happy to hear that! Such a sweet comment. Thank you Nathalie 🙂 Cheers! 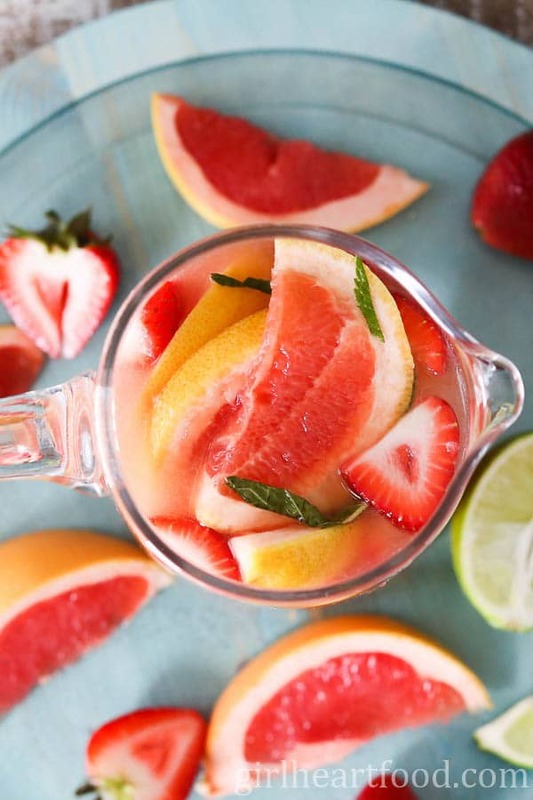 Grapefruit Rose Sangria sounds so delightfully refreshing, Dawn! I grew to love Sangria every night in Spain and have not lost the urge to have more. Thanks for sharing! You know I love my sangria, and I definitely want to try making this one over the summer! The colour is just lovely! I’m not a fan of overly sweet drinks either, so this will be perfect for my weekend enjoyment! 😉 And thank you for including a link to my sangria recipe! Much appreciated Dawn! LOVE a rosé sangria! What a lovely combination of flavours and that pretty pink colour!! I don’t love an overly-sweet drink either so I’m looking forward to trying this out! Cheers! I’m like that every morning lol! And man can I use a sangria right now (it’s 11AM BTW – that’s fine right coz this is FRUIT? lol!) We have several little parties lined up and this would be perfect. We’ve been making full use of our new backyard and embracing the non-condo life. Hope you have a better week next week!! This sounds lovely. I had no idea there is a grapefruit vodka!!! And it’s pretty, too! thanks. Thank you Mimi 🙂 Have a great week! Vacations are like that – so totally relaxing and so hard to return to normal afterwards! Glad you made it through the week. This sangria looks perfect for these hot summer days! Your pics are gorgeous!!! I hear ya. Coming back from vacation is brutal!! But I’m so glad that you made a beautiful cocktail to ease the pain. 😉 And a beautiful cocktail this is, Dawn! Wowza…pinned to try! 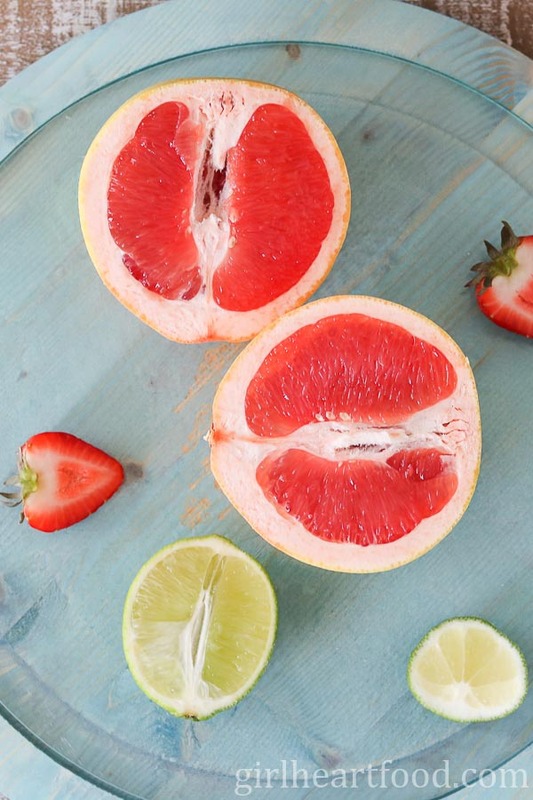 I am a HUGE grapefruit lover! This is one cocktail I have to try! Same here! Hope you enjoy, Kevin! Cheers! This cocktail looks so refreshing! Perfect for alongside the pool. Thanks for sharing! Hope you like it, Jennifer 🙂 Thanks so much! I don’t like overly sweet beverages, either. This sounds perfect! I love a nice glass of sangria on summer nights. Thank you for this amazing grapefruit rose sangria recipe – I think it is one I will be enjoying time and time again! This looks so refreshing and perfect for summer, What a fantastic take on sangria! Thank you Nathan 🙂 Sure is! Oh my! Sangria is divine! This sounds like the perfect summer sipper. 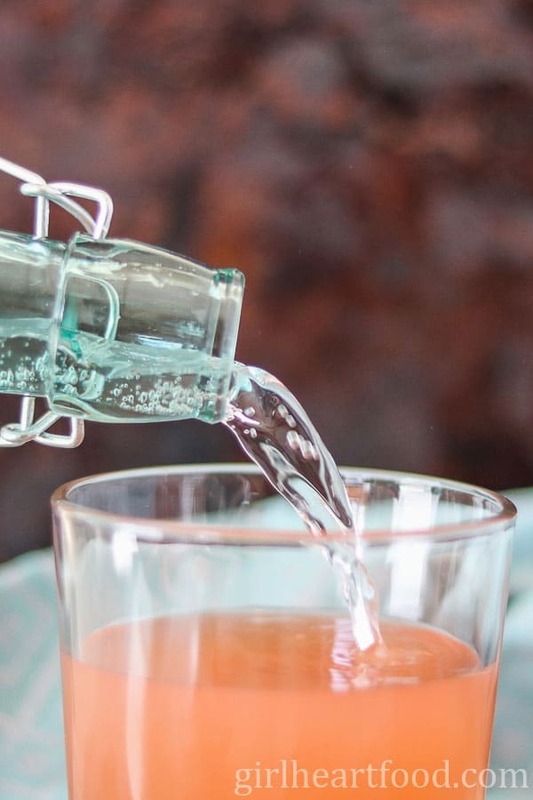 I’m with you — don’t really like sweet wines (or drinks) so a dry rose and grapefruit juice sounds refreshing and brisk. Going back to work after vacation is the WORST! I totally feel you! I’ve never strayed from traditional sangria and now I can’t figure out why! Loving everything about this recipe! This has to be the most refreshing sangria I’ve ever seen Dawn! I LOVE the addition of the grapefruit juice and vodka! I can’t wait to try this! Happy weekend! Yay! Thanks a million, Mary Ann 🙂 Happy weekend to you too! I have no words. This looks SOOOO GOOOOOD! I knew when you posted the grapefruit pic over on Insta that something good was coming :). Why isn’t sangria considered breakfast and why don’t I have a pitcher of this in my fridge right now? Love! Have a great weekend, Dawn!